Heir Apparent by Vivian Vande Velde. Review: Rassuman Gaming Center can be fun; however, it's also very dangerous. It depends if anybody breaks in and ruins the equipment. 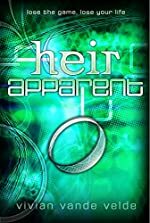 That happened only once, but of course, they had to be when Gianinne's hooked up to a game called Heir Apparent, which is also the title of this tragic, mysterious novel, written by Vivian Vande Velde. Gianinne visits the Rassuman Gaming Center and all is fine, until some people - who are wrong to believe they are civilized- break into the control center, and alter the technology while Gianinne is hooked up to a game! As a result, she is trapped Heir Apparent, and she cannot get out unless she wins this impossible puzzle. That means Gianinne must find the magic ring, answer a sort of dwarf, troll, wizard thing and his stupid riddles, create a poem for the head-chopping statue, make dozens of ghosts disappear, and return to the barbarians the crown that turns objects into gold. Oh! Did I forget to mention that the crown is guarded by a man-eating dragon? And that Janine, Gianinne's character, has limited life... and time? Yeah, there are way too many ways to get killed. Unfortunately for Janine, this is her first time playing this game, so the odds are against her. Is it possible that she will win the game in the limited time she has? Or will she be mentally demented for the rest of her life? Read Heir Apparent to find out! I personally, strongly, believe that I've been blessed with great books. Vivian Vande Velde is a better author than I can ever imagine. If there is a sequel to this book, I'll be sure that get my hands on it; I can promise anybody that. Not only does the book have a setting that in a technologically advanced world, Velde also manages to make it mimic medieval life too! However, as much praise I give, I still have to admit that I rate this book 4.999 stars. First of all, the characters are not developed enough for my liking. When I was trying to sketch the characters, I really struggled. It was like a mystery to me. On the other hand, I loved her writing style. For instance, "It was my fourteenth birthday, and I was arguing with a bus. How pathetic was that?" Another example of just plain fun writing is, "Just then, her desk dragon pooped on the desk. I should have taken it as an omen." She reveals a lot about her characters though the dialogue, "Ouch. Not a very good first impression on my family. And what was that awful smell? Oh yeah. That was me." We would like to thank Houghton Mifflin Harcourt for providing a copy of Heir Apparent for this review. Have you read Heir Apparent? How would you rate it?